I told you I wasn't done with the peppermint games. Here are some more. 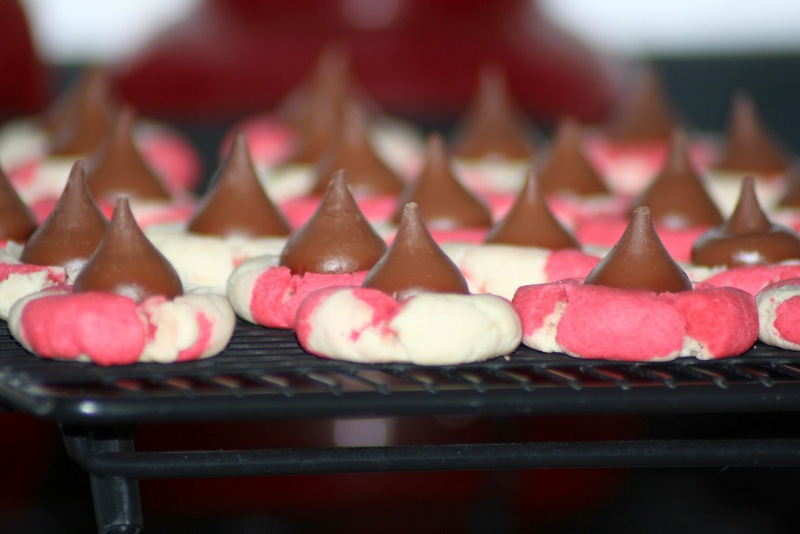 These are a favorite of mine; they were a new recipe from last year, but they will definitely be a traditional cookie in this house. And the best part? Jimmy truly believes (wait for this...) that cookies with chocolate on top like this are "ruined with too much chocolate." Clearly, he must have some sort of issue, believing such nonsense. But, it's more for me, so who am I to complain? Another bonus? If you made the Forget 'Em Cookies you can use the leftover egg yolks for these. In large bowl, cream butter and sugar together until light and fluffy. Beat in the egg yolk and extracts. Gradually add a premixed flour/salt mixture and mix well. Divide dough in half; place the red food coloring with one half of the dough. Divide the red and white portions into four sections. Cover and refrigerate for an hour. Alternate in picking small pieces off of the red and white sections (to create a swirled illusion), forming small balls (about 3/4 of an inch). Place on an ungreased cookie sheet and flatten with with a glass. These don't expand much when baking, so you can make several in a batch. 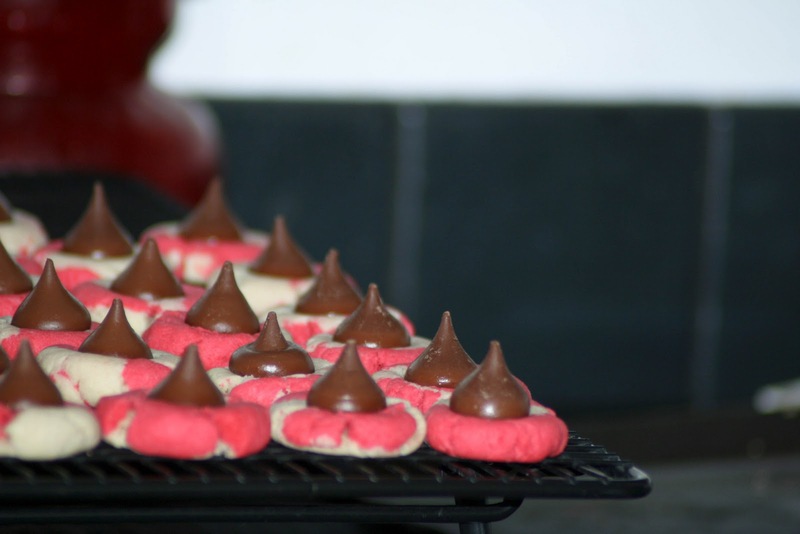 Bake for 10-12 minutes, and immediately place the chocolate kisses on top when taken from the oven. Let cool on wire rack. This is a really easy recipe to double, because it's not bulky, and they bake up quickly. Yum! Those are almost the exact opposite of the ones I made. 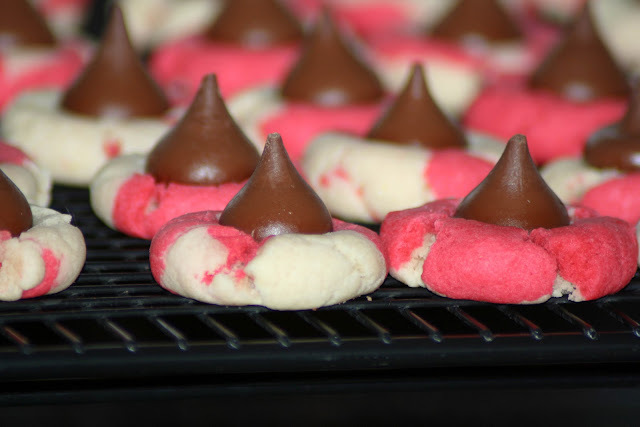 Either way it's chocolate peppermint goodness:) You sure have been busy baking!